Summary Expandable five bay, high-performance BYOD SATA NAS with many features based on a dual-core Intel Atom D2700 processor. 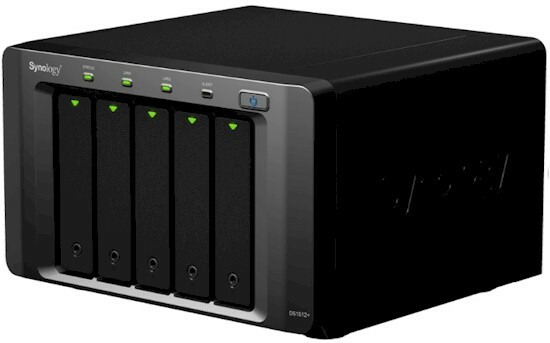 Synology must be having good success with its expandable-NAS concept, because they keep on introducing new ones. The model I'm looking at today is the five-bay-expandable-to-fifteen DS1512+. Capacity-wise, the DS1512+ is the next step up from the two bay DS712+ I looked at last fall. But hardware-wise, you should think of it as a step down from the eight-bay DS1812+ announced earlier this year. Both the 1512+ and 1812+ run on dual-core 2.13 GHz Intel "Cedar Trail" Atom D2700 CPUs with 1 GB of DDR3 RAM, expandable to 3 GB, while the older DS712+ has a single-core D425 Atom. The DS1512+ has a no-nonsense look with the same styling as the DS1511+ it replaces. The chassis and cover are metal, with a plastic front bezel. Drive trays and the internal slides that accept them are also plastic, to dampen drive vibration noise. The hot-swappable design has the drives loading from the front with individually-lockable (via hex-key) trays that accept both 2.5 and 3.5" SATA drives. The callout view below provides the rundown on ports, indicators and switches. Note that there is no VGA port to support an attached console, nor is there an LCD status panel. You'll have to get any information you want via the front panel LEDs or logging into the web-based admin. The two 10/100/1000 Ethernet ports on the rear do not have built-in link/status LEDs, either. In addition to DX510 expansion cabinets, the two rear eSATA ports support one eSATA drive each. The new hardware platform now includes two USB 3.0 ports and four USB 2.0 ports. So you can attach USB printers and drives to your heart's content. Synology made the DS1512+ easy to service. The two fans are mounted on plates so that they can be swapped out without having to open the cabinet. Once you get inside, the power supply and main board are easily removable. Expanding memory to a total of 3 GB is easy, too, via an empty SoDIMM socket that you don't have to remove the board to get at. Synology wrote to point out its new "fan failover" feature. If one fan fails, the other will speed up to compensate until the failed fan is replaced. Speaking of the board, a shot of its top is below. A dual-core Intel D2700 Atom is under one of those heatsinks and an unnamed Southbridge / companion chip is under the other. I didn't remove the heatsinks and couldn't find any references to the companion part in the system boot messages. That's a 1 GB flash Disk-on-Memory (DOM) module at the upper right. There is another small flash device on the other side of the board, I'm guessing maybe 128 MB. Table 1 puts all of this info in one place, along with a few other parts I haven't mentioned. Power consumption measured 71 W with five WD RE4 2 TB 7200 RPM (WD2003FYYS) drives that Synology supplied spun up and 34 W when the programmable drive spindown kicked in. Fan noise, in the default "Quiet" mode (the other two modes are "Cool" and "Low-Power") was audible along with some drive noise in my home office environment. So I rated the 1512+' noise as medium.